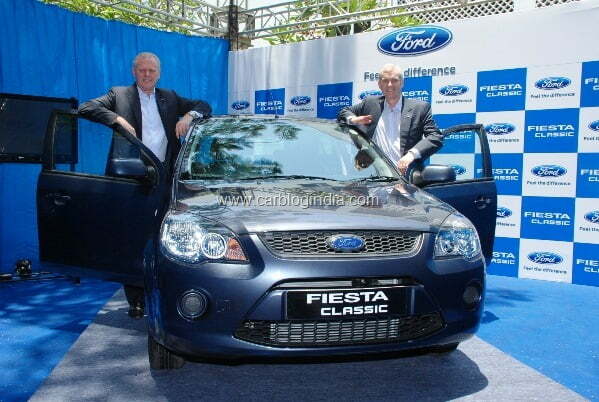 Ford has today launched the much awaited Ford Fiesta Classic in Chennai. 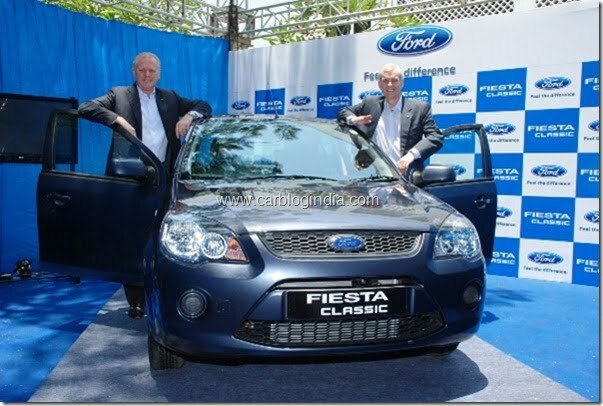 Ford India has in past sold over 1 Lakh Ford Fiesta cars in India and the car has established itself well on Indian roads as well as in the hearts of the satisfied customers. The new Fiesta Classic retains its core characteristics of surefooted balance on the road, responsive steering and compliant suspension. Its reputation as a driver’s car is enhanced by its refined, trusty and proven 1.6 Duratec MPFI Petrol engine and 1.4 Duratorq CRDI Diesel engine powertrains, which deliver on the optimum mix of gripping performance and frugal fuel consumption. The elegant new Fiesta Classic gets a refreshingly classy new interior with Ebony and Jasper Blue coloured instrument panel, a new center and floor console finished in Graphic Metallic, new seats with soft feel fabric and enhanced dual-tone door trims. In addition, all the product variants will display the ‘Classic’ moniker and will be available in a striking new body colour – Colorado Red. It is offered in both petrol and diesel engine options across three variants – LXI, CLXI and SXI to suit growing customer requirements. Thrilling performance and fuel efficiency are signature attributes of the Fiesta Classic, which customers have been experiencing and enjoying throughout their ownership. This was proven once again by delivering 30 KMPL with the diesel and 20 KMPL with the petrol, as per a cross-country drive undertaken by a leading automotive magazine. Recently, Fiesta was ranked highest by TNS for Customer Satisfaction in the `Midsize Segment’, in their latest Automotive 2010 India Total Customer Satisfaction (TCS) study. In addition to the new Colorado Red, customers can choose from the existing six colour options –Moondust Silver, Diamond White, Panther Black, Sea Grey, Morello, and Chill. The Fiesta Classic will address a much broader customer base with two new trims – LXI and CLXI. With this the Classic becomes more attractive and affordable with the petrol variants starting at Rs. 549,030 (ex-showroom, Delhi) and diesel variants at Rs. 648,000 (ex-showroom, Delhi). In its new form, the much acclaimed sedan will be available to more customers who now can experience the Fiesta Classic’s superior drivability, aesthetic styling and best-in-class fuel efficiency with an all new interior package.